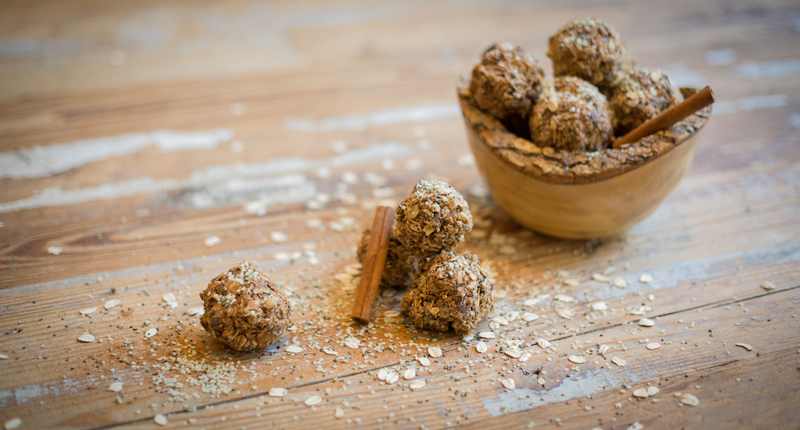 Kick off the New Year right, with Megan’s healthy and tasty, grab-n-go treat— No Bake Energy Balls. We suspect she created the recipe herself, but she won’t say. Megan is all about quick, and easy-to-make energy boosting snacks that get you through your day now matter how you work or play. She takes these along with her to the office, on a photo shoot, and with Charlie. Where will you take yours? Combine the sunflower butter, coconut oil, and vanilla extract in a pot over low heat until the ingredients are melted and mixed together. Remove from the heat and let cool. In a large bowl, combine all of the dry ingredients. Add the wet ingredients to the dry, and stir to mix until a soft dough forms. Spoon a small amount of the mixture into your hands and roll them it into a ball approximately 1-2 inches in diameter, depending on how big you’d like you’re energy balls to be. To prevent the dough from melting, don’t over-handle it. Place balls on a cookie sheet or plate, and cover with plastic wrap. Refrigerate overnight or until hard, and enjoy all week long! * Store in the refrigerator, and take them with you in a cooler bag so they won’t melt. Click here for last month’s recipe!